Our initial relief at a successful border crossing deflated almost immediately. With no real direction beyond few tips gleaned from travel blogs, we started wandering toward what we hoped was the shuttle service. Fewer than 20 feet from the visa office, we saw a naked baby, dirt-streaked and screaming on the sidewalk. He was alone. Someone had put an empty soda cup in his hand to collect money. We shuffled along. Within seconds, we were approached by the first of hundreds of people with a service to sell. We found the free shuttle from the border to the bus station, and a friendly Cambodian hopped on board, armed against our wary glances with a smile and helpful advice. He spoke a few quick words to the guy behind the ticket counter and hurried us over to an unmarked 12-seater minivan (cost: $10). “Here’s the bus to Siem Reap. A tip for my time?” We learned quick that, friendly as the locals were, it usually came with a pricetag attached. The two-hour ride from Poipet to Siem Reap was the most fascinating road trip of my life. Worn out from the early bus ride and border crossing, I put on my headphones to avoid chatter with the motley crew of strangers also making the pilgrimage to Angkor Wat. A few minutes into the trip, though, I couldn’t resist turning the music down to listen to the conversations around me. “I was born in China, you know. Made in China, you get it? But grew up in the Philippines. I don’t need money to be happy. The most important thing is my friends, having people who care about me.” Five minutes later, the attractive, 40-something Asian woman in a tight-fitting, knee-length black dress and fur cap, wearing sunglasses with green money sign lenses, went on to say that her husband “manages a famous band. We have homes in Singapore, New York and the Philippines.” The air was thick with unwanted advice, an increasingly conflicting autobiography and more misused idioms than I thought possible to cram into two hours of idle talk. Her unfortunate seatmate, a blond, dread-headed 29-year old, self-described “dude” from Germany, mustered enough interest — initially real, finally feigned — to last the first hour. After the snack stop, he took advantage of a few precious moments of silence to declare that this was “the kind of ride that makes you want to listen to music” and popped in his headphones. Funnily enough, my seatmates were Korean. After getting through my stock five phrases, much to their amusement, we all sat quietly and, I imagine, felt grateful that we weren’t sitting next to Made in China. The trip was a harbinger of things to come. 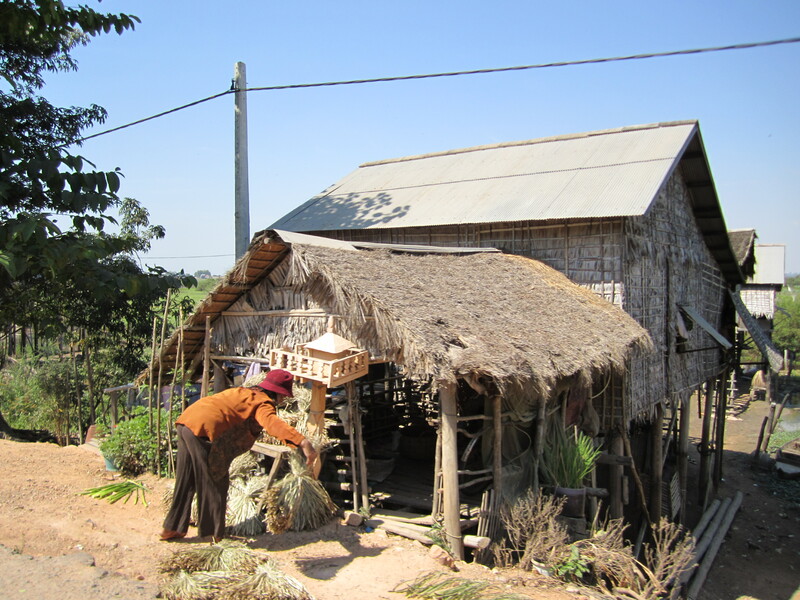 We passed palm ramshackle stilt houses, kids bathing in red-muddy lakes, palm trees, cows. When there wasn’t a family of five riding by on a two-seat scooter, it looked like Florida. Driving through downtown Siem Reap was the biggest surprise of all. I knew about the terror of the Khmer Rouge and subsequent rebuilding in Cambodia’s not-very-distant history. I’d seen Killing Fields. But I admit to having assumed that the country’s second-largest city would have paved roads. Wrong. We pulled into a parking lot of no apparent significance, and were immediately bombarded by tuk-tuk drivers offering free rides to our respective hostels. Suspicious but resigned, we loaded our packs onto a young guy’s scooter, told him where to go, and hoped for the best. It was midday. He veered away from the main road and drove farther and farther along dirt roads with nary a person, cow or house in sight. He started to fidget, taking one hand off the wheel and dangling by his pocket. The red dust kicked up around us. The tuk-tuk driver turned back toward the center of town and pulled up in front of our hostel, a two-story building that looked like it could have been lifted from the stuccoed suburbs of Miami. Relieved at reaching our destination but feeling guilty for our initial suspicion, Alex tipped our driver and declined his increasingly insistent offers to give us a tour of Angkor Wat the next day. We met our hostel manager Phil, a rotund Englishman who made Siem Reap his permanent home seven years ago. Our room was overbooked, so he upgraded us to a nearby hotel with towels folded in the shape of lotus flowers, a carved wooden headboard and a single florescent light bulb. Phil introduced us to The (pronounced “tea”), his resident tuk-tuk driver, who offered to take us to Angkor for sunset. Get your money’s worth, they said. If you buy a ticket for tomorrow after 5 p.m. today, it’s like you get an Angkorian sunset for free. So, almost exactly 12 hours after boarding the bus in Bangkok, The took us 15 kilometers out of town to catch our first sight of Angkor. Was the begging baby a common occurrence? I cannot wait to plan my own trek across Thailand, Cambodia, and Vietnam. Thanks for detailing your experience and planting more ideas for things to see and do! No, the baby part was the only time we saw this and poipet is a notorious border town (don’t spend the night!). But there are a lot of begging children in all the major cities, esp Siem Reap. It’s just something you should prepare yourself for. Really great article, thanks for writing it! Traveling to vietnam and cambodia in Aug. and always appreciate other travelers advice!